Maruti Suzuki rolls out a Limited Edition version of the WagonR that can be specified with a choice of two accessory kits. Maruti Suzuki rolls out its first special edition model in line with the upcoming festive season in the form of this limited edition WagonR. This limited edition WagonR has been given a set of aesthetic enhancements to make it feel a little bit more special over its standard counterpart. These enhancements come in the form of new seat covers with a cushion set, faux wood garnish for the centre console and door pad inserts, steering wheel cover, exterior body graphics and a rear spoiler. Maruti has also fitted the car with reverse parking sensors and a new double-DIN stereo along with a set of speakers. Maruti is offering the above mentioned enhancements in the form of two optional accessory kits. The first kit is priced at Rs. 15,490 while the complete kit is priced at Rs. 25.490. “WagonR customers have always valued substance and style; with this limited edition we intend to make this festive season even more wonderful for them. 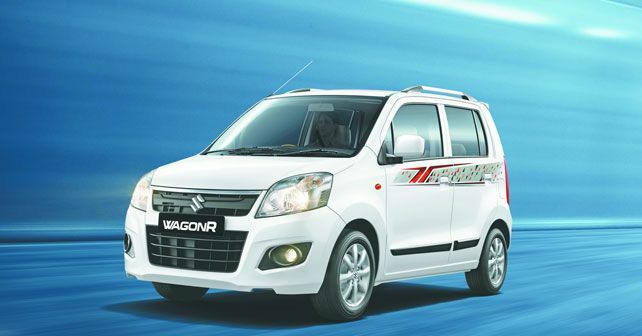 With its tall boy design, driving comfort, spacious interiors and fuel efficiency, WagonR has always been amongst the top selling models for Maruti Suzuki. We are sure this new limited edition will bring in freshness to the product and excite the customers across India,” said, R. S. Kalsi, Senior Executive Director (M&S), Maruti Suzuki. Prices for the standard WagonR currently retail between Rs. 4.14 lakh to Rs. 5.39 lakh, ex-showroom Delhi.